Whether going out for vacation or picnic, spending all day in the beach or a camping trip through the wilderness, you’d want to bring essential stuff along with you on the trip. It’s pretty hard to bring everything with you and just make it all fit in your car together with you, especially if you have companions along, as most cars just have small cargos that won’t be able to handle big and bulky things. Because of this common traveling dilemma, people have figured out a way to travel with ease while bringing their bulky things at the same time. While some car trunks are enough to fit in some stuff, the roof of the car can be transformed into a second trunk as it can be more spacious as the original trunk itself. With the great space advantage that the rooftop has, this instantly becomes the perfect place to put the huge and bulky things to avoid it from getting in the way inside the car. There’s only one more thing that that’s needed to make this way more effective to handle the big amount of baggage. This is where a rooftop cargo bag gets in the setup. 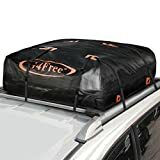 Rooftop cargo bags also called in different names including roof rack cargo bag, and rooftop cargo carrier bag, are specifically designed to carry any belonging (especially bulky stuff) and keep it safely stored on the spacious room given by the car rooftop. Although many argue about this way regarding the loss of fuel while traveling with heavy stuff on the roof, the modern vehicle designs keep things still. Rooftop cargo carrier bags come in different styles and size that suit the bag required and the car design that it will be attached to. Vehicles go with or without roof racks installed and certain bags are designed such that a roof bag can be used even if the car has no rack to set it up on. These bags also have different types in terms of weather protection; Water Resistant, Weatherproof, and Waterproof. This help users travel with convenience and confidence that their stuff won’t be affected by any weather that gets in their way while traveling. When buying a rooftop cargo carrier bag, you want to make sure that you choose the best one. However, in today’s market, a lot of these bags are sold from different brands with varied features and styles, making it quite hard to immediately know which is which. To help you more with purchasing a rooftop cargo bag below is a small guide for you to know. You should determine the size of the cargo bag that will fit on your car’s roof. You can do so by measuring the size of the space available on your car’s roof then compare it to the bags of your choice. Roof rack cargo bags can be installed on the distance between the rails of the car that has roof racks. For cars with no racks, roof bags can be installed on the flattest portion of the roof. Determine the bag size that is required for the number of things you’re putting in it. Knowing the weight capacity of your roof bag can increase the convenience you’ll get while traveling with it as you’ll know how much to include in it or how heavy it should be to make it stable while on top. Be aware of the weather protection feature that the bag has. Basically, the higher the level of weather protection it has, the higher the price of the bag has. 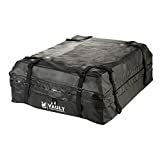 A cargo carrier bag with waterproof properties is made with a waterproof material with welded seams and Velcro zipper flap with a urethane coated zipper. A weatherproof cargo bag is made of the same material with the waterproof bag, with welded seams. It also has Velcro zipper flap with a regular zipper, in which water can go through. A water-resistant bag is also made of waterproof material with sewn seams and a Velcro or Non-Velcro zipper flap. It also comes with a regular zipper. One of the biggest companies that distribute such bags is the Thule Group. The company sees to it that the Thule cargo bags fit everyone’s needs, providing the essential storage these bags are for. This waterproof rooftop cargo bag assures you that your things are protected from the unpredictable weather while on the road. With its 44″ x 34″ x 17″ overall size, it’s specifically designed such that it fits on the roof racks of the car with its four-side attachment capabilities. The bag comes with the heavy-duty construction of rubber laminated nylon that can handle bulky items, with the help of its soft-sided design. The Keeper waterproof carrier bag can be folded up in a small storage size for later use and can be attached to and removed from the car’s roof with ease. Shield Jacket’s waterproof rooftop cargo bag features a spacious storage room for your belongings, providing 15 cubic feet of safe storage during trips, long or short. This waterproof bag is best used in cars or vans with roof rack installed. 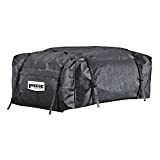 It’s completely weatherproof with its welded seam and heavy-duty construction, providing luggage protection against rain, snow, sun, and wind. The bag is designed to have 8 built-in tie straps for easier installation. The bag can conveniently hold big and bulky belongings with its overall size of 43″ x 34″ x 17″ and soft-sided design. When not in use, the bag can be folded and stored anywhere. During heavy rains, water might go through the zippers. Reese Explore’s car top carrier is specifically designed to store your belongings safe while traveling. It fits all vehicles with installed roof racks so you won’t have to worry if it will fit on your car, as long as it has roof racks. The ease of attaching the bag to the car’s roof is provided as it comes with securing straps. The bag is rainproof and will greatly protect your stuff from the unpredictable weather, especially rain, which might get in your way when on the road. Added luggage protection as it’s rain proof. It’s hard to mount and shape while packing. This cargo bag provides additional cargo storage when traveling. It comes with a ratchet or lashing straps used to attach it to the car’s roof. The bag is constructed of heavy-duty canvas that helps for the protection of the luggage. For additional safety, use the roof bag’s protective mat and strap. Keeper’s premium waterproof cargo bag features 15 cubic feet of space, providing additional storage for your big and bulky luggage. Its waterproof design protects your belongings from sun, wind, rain, and grit, during long or short travels. The bag’s soft-sided design fit odd-shaped stuff conveniently. The bag can be folded for storage and later use. The waterproof cargo bag offers additional space for essential belongings. The product is designed to provide protection on your luggage while on the road. The bag has an overall size of 44″ x 37″ x 17″. It can be folded for easier storage when not in use. Heavy rain might get water through its zipper. It might develop small rips during certain traveling conditions. 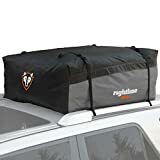 This extra large waterproof cargo carrier bag has an overall size of 55″ x 37″ x 15.8″, providing protection against unpredictable weather conditions during road trips. The bag comes with seatbelt-style straps that are 3000 lbs strong that are designed to secure the cargo bag on your vehicle, even without a roof rack installed. This waterproof carrier is constructed from PVC semi-coated mesh and Hydrotuff Material that are sewn and welded together to provide water resistance. The urethane-coated zipper also keeps the water out. The bag is specifically designed for vehicles even without a roof rack installed. The carrier is designed for strong water resistance. This is the end of this roof bag review article, tackling the top 7 picks of the best rooftop cargo bags available in today’s market. Hope you found it helpful.